It’s been exactly two months to the day since I last posted to this blog and I can’t believe just how that time has flown! Well of course, it’s not just the time that has been flying either. Despite the absence of blog updates, I have been making steady progress with my flight training and am now about a quarter of an hour short of reaching a third of my minimum hour requirement. The past couple of weeks has seen my ninth lesson postponed at least twice, preventing me from breaking the 10 hour mark. All being well, next week should fix that hopefully. So, where exactly am I in the training syllabus right now? I’m two lessons off of completing all of the basic flying exercises, which in short means that I have learnt enough to handle and control the aircraft through all the normal maneuvers between takeoff and landing. I have two lessons of stall training to complete and then I’m ready to begin practicing circuits around the airfield. Based on my progress thus far, my instructor estimates that after a further eight or nine hours of circuits I am likely to be ready to ‘go solo’. Yes, that’s right. Flying around the aerodrome, on my own, alone in the cockpit. And yes, that prospect is still very scary. Before I can do that though, there is another small matter to consider and that is the passing of some exams. Even though I might be ready to solo in terms of physical control of the aircraft, there is a legal requirement for me to have at least passed an exam in the subject of Air Law, and I expect to be taking exams in a further two subjects at the same time – Radio Telephony and Human Performance & Limitations. All of this now comes at a time when work is coming in for the new year and I’m getting busier with my job, so I know I’m going to really start feeling the pressure of trying to maintain regular flying lessons, at the same time as studying for my exams and making a living! I’ve thoroughly enjoyed my training thus far though and the past few weeks have taught me a great deal about both myself and the skills and attitude needed to be a pilot. I’ve experienced some exciting and challenging situations, beheld some incredible views and faced a variety of different weather conditions. My confidence is building and piloting the aircraft is beginning to feel more habitual and natural each time I go up. There is still a good way to go and several hurdles and challenges yet to overcome, but I’m looking forward to taking them on. Understandably, I could wax lyrical all night about everything that has happened over the past two months, but I’ll keep this entry at the length it is. If you’re reading this and have any questions about specific aspects of my training so far, please feel free to ask them in the comments and I’ll explain more. All being well, I’ll get back to some more regular updates in 2017. How’s your relationship with ‘the lemon coloured nemesis’ coming along? Have you had opportunity to get used to it, or do you still prefer the layout of the first aircraft you went up in? G-BMXB, the ‘lemon coloured nemesis’ has been suspiciously absent recently and I think all of my lessons over the past couple of months have been in G-CEPX (https://farm8.staticflickr.com/7447/16354607408_a2f03e9413_b.jpg). Fundamentally, the cockpit layouts are similar, but slight variations can throw you off sometimes. 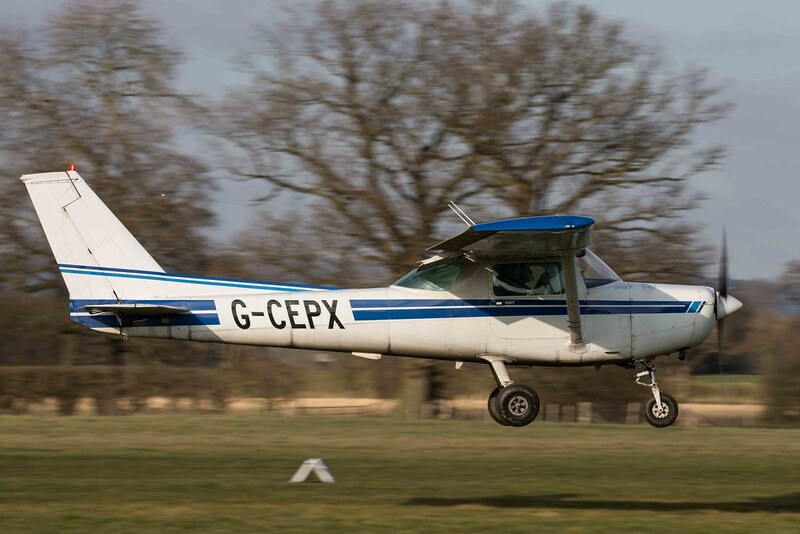 For example, G-CEPX has a suction warning lamp that lights up when the throttle is reduced to idle and initially that kept drawing my attention because the other C152’s don’t have it and I kept thinking it was an emergency warning light. Because of their age, most of the late 70’s/early 80’s era planes have something or other wrong with them. G-CEPX hopefully will have had it’s service by now, but it needed the flaps looking at because you could set 10 degrees using the lever and then it would skip 20 degrees and lower the full 30 degrees. Not critical, but irritating and it’s these little differences that make jumping into different aircraft for lessons some getting used to. I went sailing one weekend and after thought if i needed to get off a desert island i was reasonably confident I coud sail a boat and live. Does that ‘yard stick’ apply to your current flying aptitude? In theory, yes I suppose it does. I now know enough about control, speeds etc. to be able to fly the aircraft, although landing safely and consistently is still not second nature. That’s the purpose of the several hours of upcoming practice flying circuits really. Where did you go sailing btw?